The flight from Melbourne to Honolulu was relatively short – as far as international flights from Australia go – and if Jetstar isn’t exactly Emirates, it’s not quite as bad as you might think. And the Airbus A320-200 remains my favourite long-haul aircraft. We arrived at 6 am local time, checked-in early, had three hours of sleep and then went for a walk around Honolulu. Hawaii has an extraordinarily chequered past. It’s the only US state to have once been a monarchy, the Queen being overthrown by what appears to be a ragtag bag of self-interested UK and US businessmen seeking better financial outcomes for themselves. That was in 1893; the country then became a short-lived republic before being ‘annexed’ by the US in 1898. It finally became a US state in 1959. Obviously, the naval (and air) base at Pearl Harbor preceded statehood – more on Pearl Harbor in a moment. 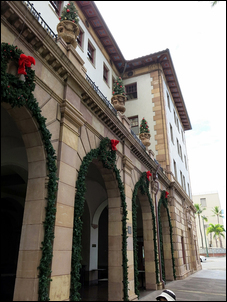 The fascinating thing about walking around Honolulu is the architecture very much reveals the story of the past. The grand old buildings of the monarchy still stand; to my Australian eyes, they look very much like Victorian-era United Kingdom colonial architecture. Sandstone and deep verandas – that type of building. 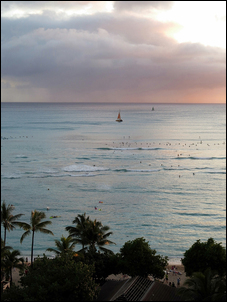 Honolulu is a large, bustling and gridlocked city. The roads – proper freeways – come to a halt around 5pm: the trip from the airport to downtown Honolulu (around 15km) took us about an hour. Waikiki is rather like Australia’s Gold Coast multiplied by two, but get outside the business and tourist areas and Honolulu has plenty of the poor quality housing that we were later to see all around the islands. We stayed in Honolulu only the one night then flew by small jet to the Big Island… the island where all the active volcanoes are located. Landing in Kona was an eye-opener – the airport has been built directly on relatively recent lava flows. 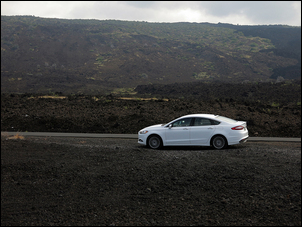 We hired a car – a turbo four cylinder Ford Fusion – and drove around the coast road to the Hawaii Volcanoes National Park, a reserve that encompasses the main active volcanoes. On some excellent advice (thanks Art! 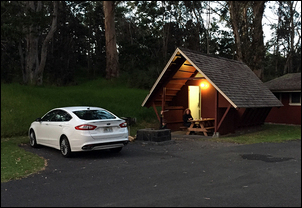 ), we chose to stay in some ‘camping huts’ within the National Park – relatively cheap, but with bed linen and towels provided. The next day we went on some of the walks the staff at the Visitors’ Centre had recommended for two adults and a ten-year-old. The first walk was across the sunken floor of a recently active volcano. 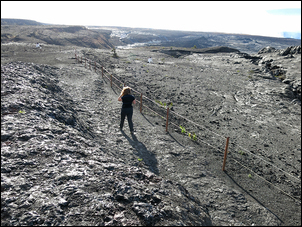 Kīlauea Iki was erupting in the 1950s – you can now walk across the crater, literally standing on the rock that was born in only the last 60-odd years. 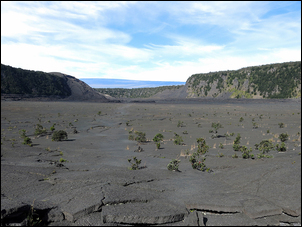 To see a landscape shaped entirely by volcanic activity, and with almost no changes caused by weathering or erosion, was surreal. 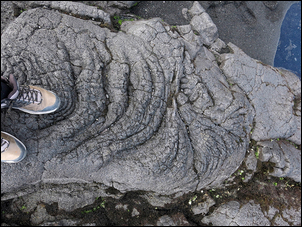 You could see swirling patterns in the rock that indicated its flow when it was a liquid, see olivine crystals that had developed as the lava cooled, and step across cracks that developed as the magma beneath contracted and the crater floor sank. And all of this was so recent that steam was still escaping from vents scattered across the crater… only metres either side of the path in fact. Barely a plant grew on the barren landscape. On Hawaii’s Big Island there is lava just everywhere. 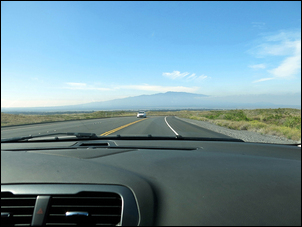 We walked across another landscape covered in splatters of lava that had fallen from the sky and spread on impact – like seagull droppings, but ranging in size from a dinner plate to a small car. 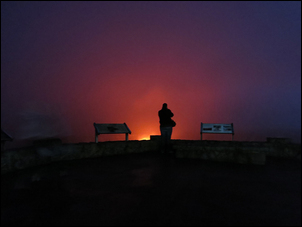 We peered into the distance at gas rising from a hidden vent – and then went back to another viewing spot that evening to see the cloud of escaping gas lit bright-red by the molten rock in the vent below. I have been interested in rocks and landforms all my life, and for me this alien, hostile and fearsome environment was like nothing I have ever seen. We went to the town that was destroyed by a lava flow, the lava stopping only after the town was enveloped and the lava met the sea. The black beach that has since developed is uncanny. At another location, the white, bleached bones of animals that the lava met as it moved across the landscape are visible; so too are local monuments to memories destroyed by the inexorable movement of the molten rock. To put it mildly, it was quite amazing to be settling under a quilt in a comfortable bed… less than a kilometre from a breach in the earth’s surface where the red inner glare filled the sky. Today, back in Honolulu, we went to Pearl Harbor. Initially it’s a bit confusing as to what you can actually see at Pearl Harbor, this so important of World War II history sites. 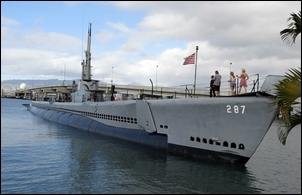 We went to the Arizona memorial, the USS Bowfin submarine and museum, to the battleship Missouri, and the Pacific aviation museum. 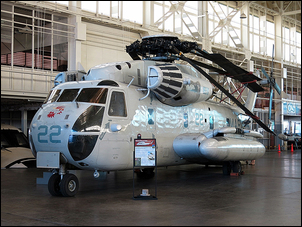 The logistics of getting from one to the other are well-covered - the Missouri and aviation museum are on an island and are accessible by shuttle bus; the Arizona is accessed by a shuttle boat (all shuttles are free). The Arizona memorial is also free if you get to the site early enough (we did), however the other attractions are eye-wateringly expensive. For two adults and a ten-year-old, the bill was US$145… making them the most expensive museums we’ve ever been to. The Arizona memorial was an interesting cultural experience. The memorial building is located over the hulk of the battleship Arizona, the final resting place of a large number of its crew. 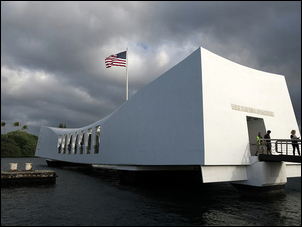 A film precedes the trip to the memorial; the film is relatively even-handed but absolutely avoids stating the obvious – that Pearl Harbor was a triumph for the Japanese war machine. And the memorial tour itself? As an Australian, I found it a bit over the top - the saluting of US flags; the hugging of US flags; small US flags being raised, taken down and then replaced by big US flags - all in hushed tones. Perhaps the most interesting thing when you view the statistics of the Pearl Harbor attack was the magnitude of the success enjoyed by the Japanese. They lost (in comparative terms) almost no men or aircraft, inflicted enormous damage with apparent pin-point accuracy, and utterly surprised the US defences. But the Japanese success was also the start of their defeat. With the American public galvanised into supporting an immediate declaration of war by the US on Japan and Germany, there was simply no way that over the medium and long-term, the Axis powers could hope to beat the American might of men and industrial production. Some of that industrial production could be seen in the warplanes on display at the Pacific Aviation museum. However, I thought the museum a disappointment. Perhaps we’ve been spoiled by the incredible aviation museums we have previously visited (Duxford in the UK springs to mind) but this is a small museum with a quite limited range of aircraft, very few artefacts and only two engines on display. The volunteer staff were helpful and I found the large helicopters of interest, but it would be hard to spend longer than an hour there. On the other hand, I found the Bowfin submarine and its associated museum fascinating. You can walk through the Bowfin, listening to an audio guide (unfortunately we were directed to the guide for kids and didn’t realise we were listening to the simplified version until we’d left – at least 10-year-old Alexander enjoyed it!) but it’s the submarine itself that is intriguing. The Bowfin is so big that it has room for a large metal-turning lathe in the maintenance area! 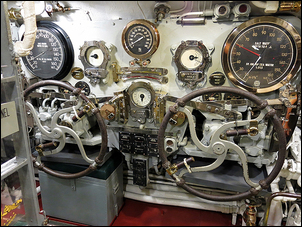 The sub is in superb condition – almost like a new submarine – and so it has the atmosphere of a well-maintained working machine, rather than a shop-worn museum piece. Back on land, the submarine museum is also good. It’s not large, but the selection of displays is quite amazing. You need to look closely and read the signs, but there on the wall is the photo showing the Japanese signing the WWII surrender on the decks of the Missouri, and – from more recent times – the command and control centre for launching Polaris nuclear missiles from a Cold War submarine. 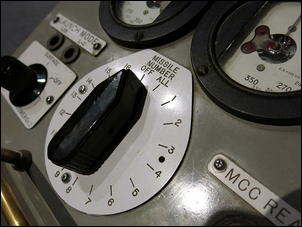 I have before never seen the buttons that could have literally launched nuclear Armageddon; to be able to look at the complete console right before my nose was sensationally uncomfortable. The Missouri? It was OK – the battleship is huge and it’s interesting to walk around it. However, the access does not extend to the bridge, the engine room, magazines or the gun turrets. In effect, it’s a tour of how US sailors were housed and fed on a large naval ship. I think I’d probably have skipped it had I known what it was going to involve – especially at the exorbitant cost. Tomorrow we spend the day here in Waikiki, and then the next day we fly to the continental US - Chicago via a Las Vegas 3-hour airport stopover. We expect Chicago to be a major climatic and cultural change! Extraordinary landscapes – the closer you look, the more you see. One or two days. Add another day to see other volcanic sites around the island.